There is no other theory more summarily assumed and imposed by institutions of higher education and mass media than that of egalitarianism (the idea that all people are exactly equal in all respects and distinctive social roles are the unfortunate byproducts of cultural indoctrination). What is important to note is that I do not care if this hypothesis is true. What bugs me particularly is that there is never any material, historical, spiritual or cultural reasons given for believing that it is! This apparently natural human state of general human equality is an assertion as naked as the day we were born. Scientific naturalism certainly gives no reason for believing in such human equality—in fact, there are very good biological reasons for rejecting the hypothesis outright. There are no anthropological or cultural reasons for believing it –some gynocentric claims of a mythical prehistory notwithstanding. Spiritually, as a Christian, I am compelled to believe that persons are of equal worth and essence through the power of the living Christ. I am not similarly compelled, however, to believe that this equality of worth translates into an equality of functionality. I prefer the idea of diversity, the idea that sees the homogenization of cultures into a politically correct equalitarian state as preposterous and morally wrong. 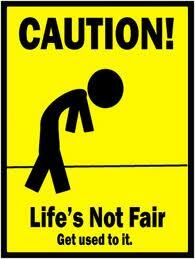 Life is not fair, or equal. So if you make claims to metaphysical entitlements that are manifestly illusory, then it is your own fault when you are met with reality.